Preheat the broiler. Line a baking sheet with aluminum foil. Place the pepper halves on the prepared baking sheet and broil for 5-10 minutes until well charred. Remove the peppers from the oven and place in a bowl; cover tightly with plastic wrap (so they steam) and let cool until luke warm. Peel the skin from the peppers (do not rinse under water) and cut into 3/4-inch strips. Place back in the bowl; add the olive oil, red wine vinegar, garlic, 2 tablespoons of the basil, oregano, sugar, salt and pepper. Refrigerate for at least one hour or overnight. 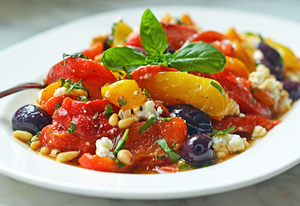 Transfer the marinated peppers to a serving dish and top with the feta, olives, toasted pine nuts and remaining tablespoon basil (do not toss). Garnish with whole basil leaves if desired. Kale is one of the Super foods discussed in my book, Fabulous Foods For Health and Healing and one of my favorite veggies! Heat olive oil in a large saucepan over medium-high heat. Add the garlic and sun dried tomatoes and cook until soft. The garlic should be slightly colored. Raise heat to high, add the stock and kale and toss to combine. Cover and cook for 5 minutes. Remove cover and continue to cook, stirring until all the liquid has evaporated. Season with salt and pepper to taste and add vinegar. Green Skinny Juice TalkBoss Style!